Posted 8/25/2016 11:50am by Teri Watson. What a great garlic year it has been! We now have seed stock available for your fall plantings. If you are local, come out to the Hot & Stinky Garlic Festival in Drums, PA this weekend. Come get your garlic seed and enjoy the day! Information on the festival can be found at www.zanolininursery.net. Mad Dog will be there on Saturday only. 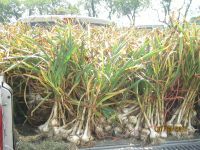 Along with seed stock, we will have food grade garlic, garlic powder, salt, and our black garlic! If you prefer, we can ship as well. Just email us and let us know what varieties you are looking for and quantities and we will be in touch. Garden variety packs are $15.00/lb and include 3 varieties. Please put put any orders in early as we sell out of seed very quickly!